What is the best way to go about buying a loose diamond for an engagement ring you already own? My boyfriend was given a ring that belonged to his stepfather’s late wife. It’s absolutely gorgeous, but the stone was removed. We are working together to become engaged, and we want to find a diamond together. Where do we start with all the appraisals, rock shopping, resizing, etc? First thing for you to do is get some education on diamonds and what all the acronims mean and what is decent quality for which cut. Colour: D – G anything after that is faint yellow and will not hold its value as well. Dark bands or triangles show areas where light is leaking from the diamond. When choosing the cut always go for the one you like to look at, thats the most important part after all. I then suggest you go to a reputable private jeweller and ask if they sell loose stones (most do). You tell them what you want and they do the leg work. They will order the stones in for you to see, you should not pay any money at all to the jewellers just to see the stones (some try to scam you like that, it doesn’t cost them more than a few $ to get them in). Always look at 2 or 3 stones next to each other so you can compare. Get the details and compare the prices online (which are retail prices despite them saying things like “wholesale direct to public”), remember that shops do have overheads though and they will be slightly more expensive, but 200% additional or more is ridiculous (I have seen heaps of jewellers do this). Do your research and go with your gut on whether it seems to much for the size and quality. 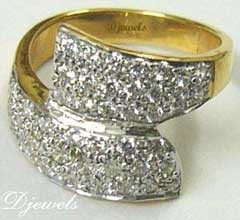 You will also have to take the setting in with you as they really can’t be altered all that much, you will have to go with a stone close to the size it was already set with, with a little leeway bigger or smaller. It is also a good idea to go to many different jewellers for differernt quotes, you will see the huge price range you get for the same thing. Also try private/independant jewellery artisans as they are sometimes the most competitive. This entry was posted in Glittering Diamonds and tagged cut, diamond, diamonds, engagement, wedding on December 19, 2009 by admin.